While our black sample of the Corsair Vengeance K70 uses Cherry MX red switches, a silver edition is also available and Corsair has announced that the option to use blue or brown switches for the same price will be made available too. Naturally preferences will vary, but the non-click, light action of the red switches provides a very smooth and light typing experience that membrane boards simply cannot match. Red switches are also a preferred choice for gaming due to their light, fast action, making this a good all-rounder of a keyboard. Though nothing special, Corsair's printed keycaps are decent enough, as they are well made and offer a nice balanced level of grip for a great experience in all situations. 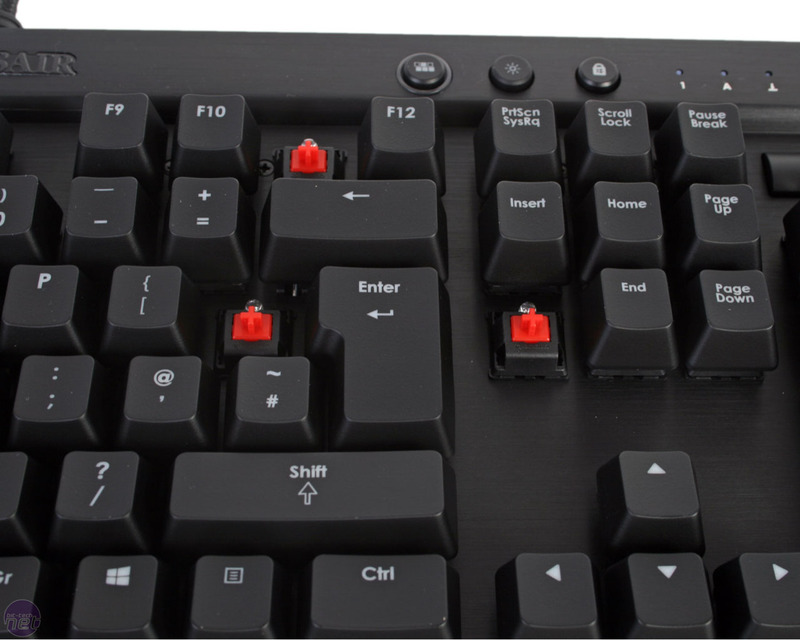 Another plus is that unlike the K60, the K70 has a fully mechanical set of keys. This is undoubtedly a factor in its higher price, but it also means that your experience is always consistent and that all the main keys can be easily replaced in the future. 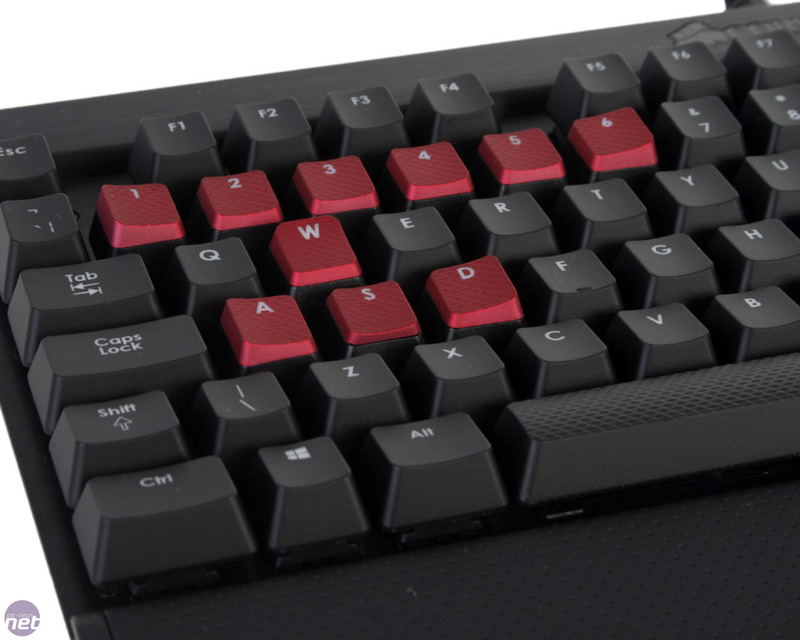 The extra set of red FPS keys (WASD and 1-6) also makes a reappearance. Being contoured, textured and a different colour from the other keys, they're designed to be easier to locate, but, as before, being already used to these key locations meant that we struggled to find any real benefit in them. In fact, though the extra grip they afford isn't an issue in games, it's noticeable and annoying when typing, so we quickly decided to leave the regular keys as they come. A further useful addition is the backlighting behind every key, which is deep red in our sample. The lighting can be disabled or set to one of three brightness levels, and you can choose between having all the keys lit or only the ones you want. Holding down the backlight button disables key functionality and allows you to toggle the individual lights, and holding it down again saves the arrangement. This does limit you to one saved profile, but it's a wonderfully simple solution and we have to praise Corsair again for not resorting to software. As the LEDs rest below the tops of the keycaps, most of them are illuminated well, although any key functions printed on the lower half of the keys don't come through quite as brightly. Other than the largely redundant BIOS switch, the new additions to the Corsair Vengeance K70 over the K60 are well thought out and genuinely useful. The backlighting will aid typing and gaming in low light situations, while the per key programming for it lends a degree of customisation to the board without over complicating things. A full sized wrist rest is likewise a sensible inclusion, and we're never going to complain about having more Cherry MX red switches to play with. Corsair's decision to offer versions with different types of switch and backlighting is also a smart one. The design aspects carried over from the K60, such as the USB pass through, media keys and aluminium chassis aren't particularly necessary ones, but they're not without merit and are implemented subtly so as to not interfere with the keyboard's main functions. If all you want is the mechanical experience, simpler boards like the Ozone Strike or Corsair's own mostly mechanical Vengeance K60 are worthy and significantly cheaper options, but equally there's almost nothing to dislike about the K70. It's a comfortable and beautiful piece of engineering that comes highly recommended provided you're willing to splash the requisite cash. The K70 returns in its best ever form. We review both the keyboard and mouse in Asus's new Strix lineup - how do they fare?